Tonight is The Simpsons’ 21st annual “Treehouse of Horror” episode. I suppose I’ll watch, which is a far cry from the days of yore when I built my expectations for the Halloween special way beyond reasonable levels. In retrospect, I don’t know why I always looked forward to Treehouse of Horror, because those episodes are generally not among my favorites. I find them fairly average to be honest. I guess it was because, on those rare occasions when Treehouse of Horror was on top of its game, it was as good as The Simpsons could be. It could somehow pay tribute to source material while parodying it, it could be silly but in a good way,* and it could provide us with some of the series’ most memorable lines and moments. It has given us Kang and Kodos, “Mosi Tatupu, Mosi Tatupu,” Homer killing the zombie Flanders (“He was a zombie?”), lousy Smarch weather, “Guess I forgot to put the fog lights in,” and the concept of reeee-Neducation. *An idea epitomized, I think, by the fog that turns people inside out. The last genuinely intriguing Treehouse of Horror short came an even decade ago, with Snarky talking man and plenty of imagery from The Birds (I’m such a sucker for Hitchcock that I don’t mind that the odes to The Birds in “A Streetcar Named Marge” were better). It also included another bumbling effort from Chief Wiggum (“Bottlenose bruises, blowhole burns, flipper prints—this looks like the work of rowdy teens. Lou, cancel the prom”)* and the physical comedy of dolphins beating up Springfieldianites. In the end, you’ve got to hand it to those dolphins. They just wanted it more. Treehouse of Horror I has aged fairly well—I’d probably call it the second or third best iteration of the special in the series’ history—and James Earl Jones’ narration of Edgar Allan Poe’s well-known poem is pretty cool. It’s not original, and it’s not funny at all. It’s just cool. One of the best-known shorts, Homer’s tryst with the devil Flanders (“It’s always who you least expect”) gives us “Mmm…forbidden donut,” the Ironic Punishment Division, Lionel Hutz’s “But I ask you, what is a contract?”, and a jury that includes Lizzie Borden and the starting line of the 1976 Philadelphia Flyers. This might include my two favorite lines in ToH history. There is, of course, Maggie’s famous first line spoken with the voice of James Earl Jones: “This is indeed a disturbing universe.” But before that, we have Homer getting his hand stuck in the toaster not once, but twice. Every time Bart yells, “Dad, it’s in there AGAIN!” I can’t contain myself. And Flanders as the unquestioned lord and master of the universe makes up for the incongruity of there being replica houses for “an insect that looks like Dad” in the second universe. “Hungry Are the Damned” is a great example of The Simpsons subverting your expectations at every turn. The story plays into so many basic film stereotypes—the green lighting, the portrayal of the aliens, and the underlying suspicion. At the same time, it pokes fun at them—the aliens speak the same language “by a remarkable coincidence” (even though one of them has a name that can’t be pronounced with a tongue…weird)—and exploits the inquisitive nature of Lisa to give her one of her most memorable comeuppances. You know I love Lisa, but scenes like this and the one when she tries out for the football team in “Bart Star” hilariously provide an important (and not preachy) balance to her activism. *I think I know this line as well as any by an actual American President. This is the Treehouse of Horror episode and short by which all others are judged. I haven’t even seen The Shining, which means that while I understand most of the references, I’ll find even more to laugh about after I watch the source material. 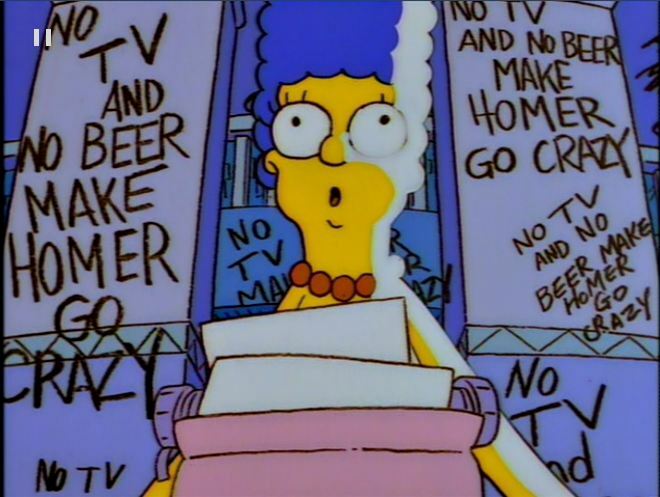 Marge and the kids “are just gonna have to wait and see” if Homer is going to kill them, and the “No TV and no beer…” scene is the most iconic in the special’s history. “The Shinning” is Treehouse of Horror, and The Simpsons, at its best.